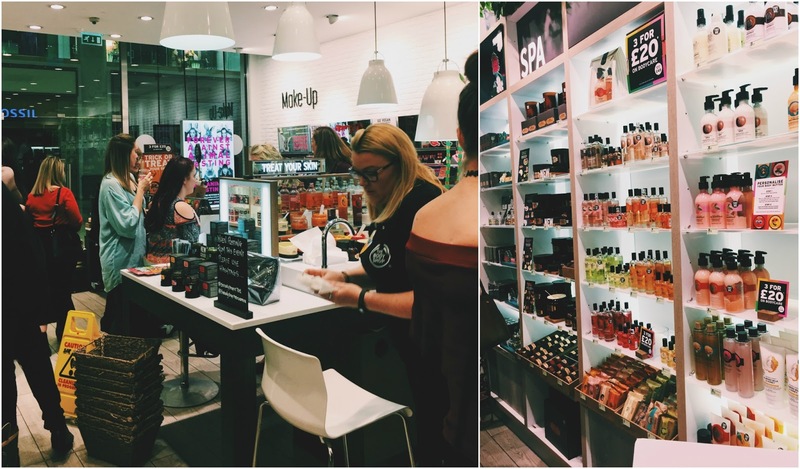 On Sunday 8th October, I was lucky enough to attend a Blogger Event with The Body Shop, hosted by Gianni from The G Edit. 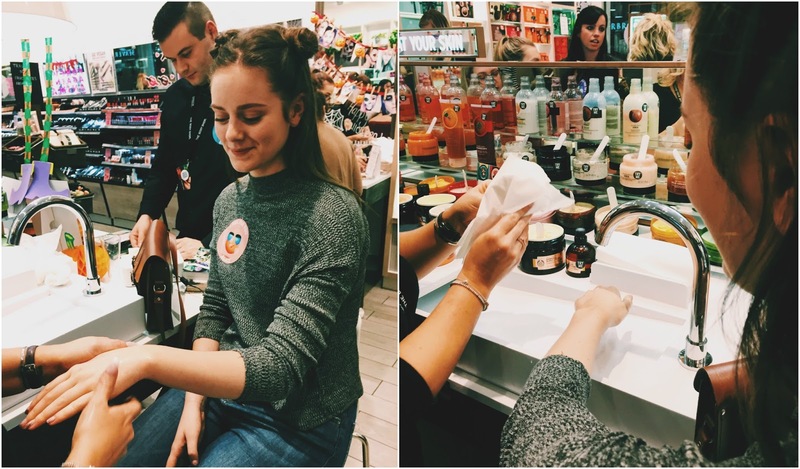 The Blogger Event was based around showcasing the new products in The Body Shop, the uniting for North East Bloggers, and generally having a fun time and learning more about The Body Shop products. 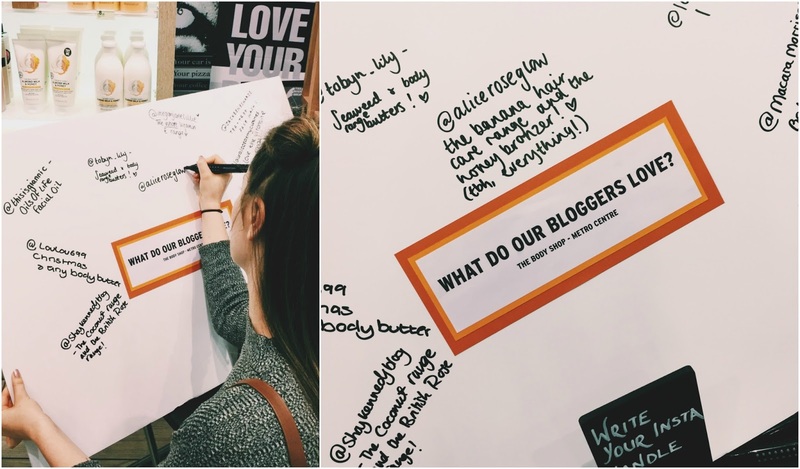 For me, this was only my 2nd EVER blogger event and, because there was only about 30 of us, I felt very lucky to be there. Along with my invite, we were told we were allowed to bring along a plus-one; for this, I decided to bring my boyfriend along with me because A) he drives, so could take me up to the Metro Centre, B) It meant we could enjoy a little meal out together, C) I really wanted him to experience what a Blogger event is like and D) He secretly loves The Body Shop. Before the event, we had a dabble around some of the shops including (OMG) Homesense. After that, we enjoyed some delicious pizzas in Pizza Express before heading to the event. When we entered, we were greeted with the lovely Store Manager alongside Gianni and were shown along to the free Prosecco and nibbles. I mean, I definitely didn't say no to the Prosecco. I was given a demo of the new face masks on my hands - this was using the Chinese Ginseng & Rice polishing mask which is designed to revitalise the skin then, upon removal, act as a face scrub. The smell of this mask was beautifully oriental and zingy and genuinely left my hand feeling super cleansed and soft. On the other hand, I tried out the British Rose Mask which is typically applied to wet skin and has more of a gel consistency. This one is more for plumping and rejuvenating skin which, understandably can be difficult to see on the back of the hand but definitely left me in aroma-heaven. After we were introduced to the team and the event with a little speech, Jamie (my boyfriend) and I went to get our personalised labels. 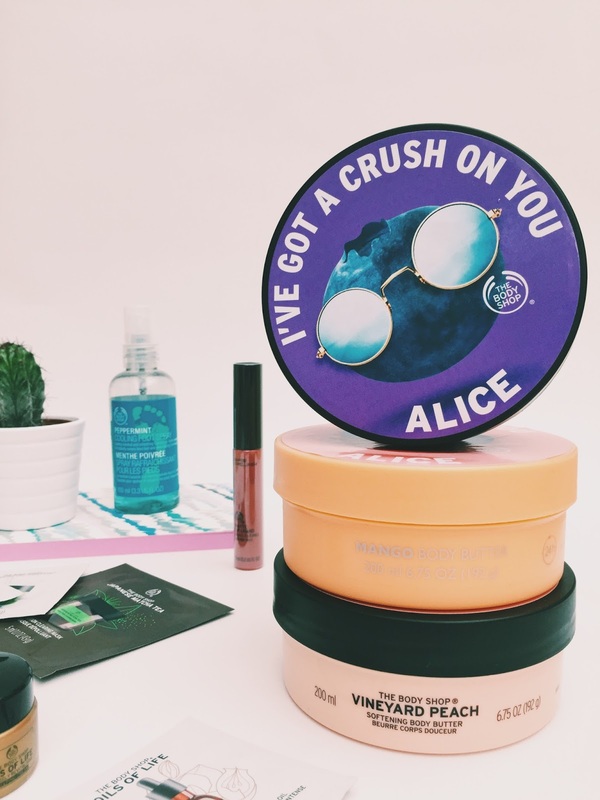 Each person there was lucky enough to be gifted a free Body Butter, so I chose the Blueberry one (cus I loooove blueberries and had never used that one before) then got my name personalised on the Blueberry 'I've got a Crush on you' sticker. I got another sticker too to wear as a name badge but then I pasted it on to my Mango Body Butter that I have at home. 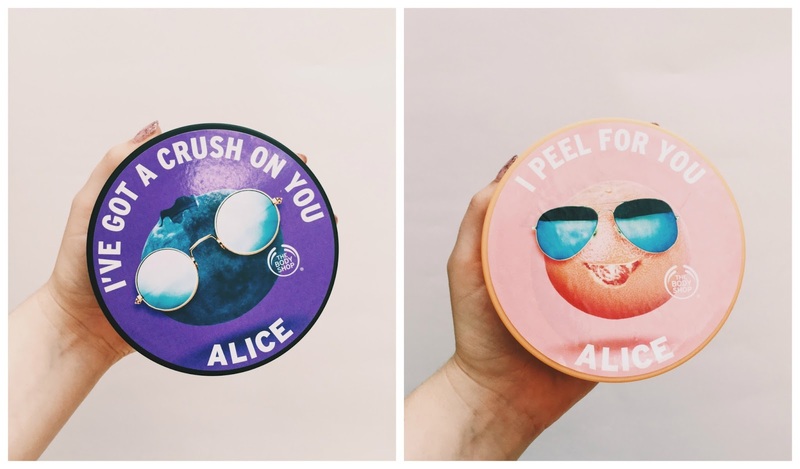 These personalised body butters are so cute and funky, I think it's a great idea. I think the thing that I valued the most from this event, was simply having the time to really look at each product. 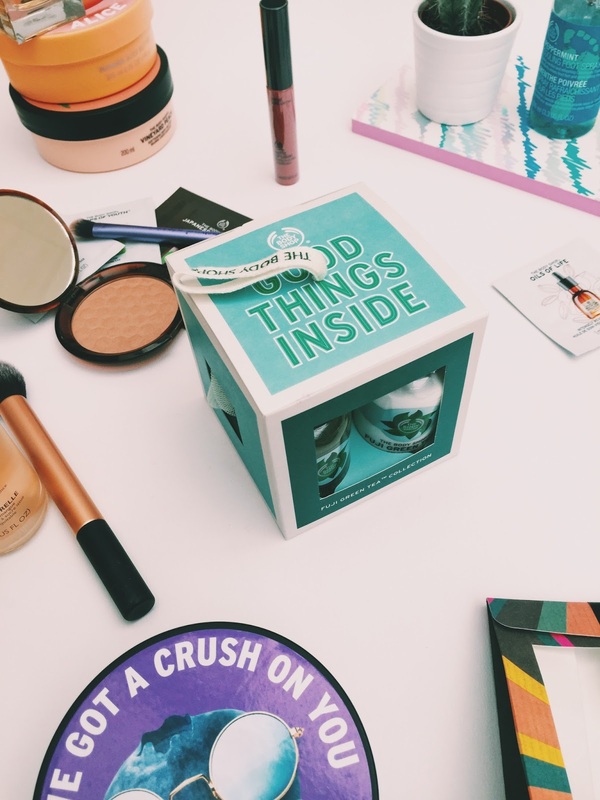 I learned about products that I'd never seen, got to really explore the different ranges in depth, and widen my wish list. Amongst it all, was the amazing customer service - the staff were just so welcoming and friendly and it was the kind of experience where they're happy to help but not 'in-your-face'. Throughout the shop was different 'stations' including the Board in which we could write down our favourite products. At the start of the evening I wrote 'The banana hair care range and the Honey bronzer' but, after the evening and having the time to explore more products, I would definitely add the Blueberry body butter, the Fuji Green Tea scent, and the new Elixirs of Nature Eau De Parfums in Widdringtonia and Bowhanti. 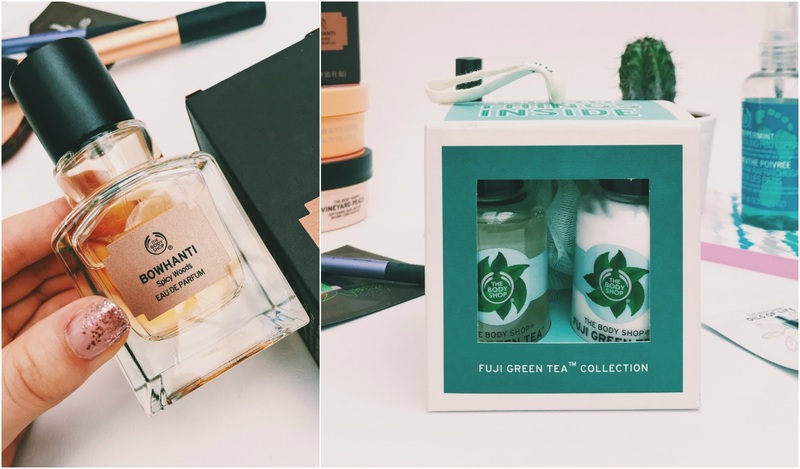 Jamie and I took advantage of our amazing Blogger's 30% off and bought the Bowhanti unisex fragrance and a small set of the Fuji Green Tea range (and I've already gone and ordered more Green Tea products - it smells amazing). The next 'station' was the petition signing for a global ban on Animal Testing. The lovely staff member Chris helped me learn about the reality and the shocking facts of Animal Testing in the world today and I didn't hesitate to sign the petition. It's such an important cause. Towards the very end of the evening, as the store was somewhat quietening down, I sat down for a hand massage by one of the store assistants. She used the Spa Of The World Range which to me justr radiates indulgence and comfort. The spa range seems like the kind of product that would be perfect for a Sunday evening to relax and care for your skin ahead of a new week. I think it's fair to say that I was sniffing my hand all the way home in the car - no shame. 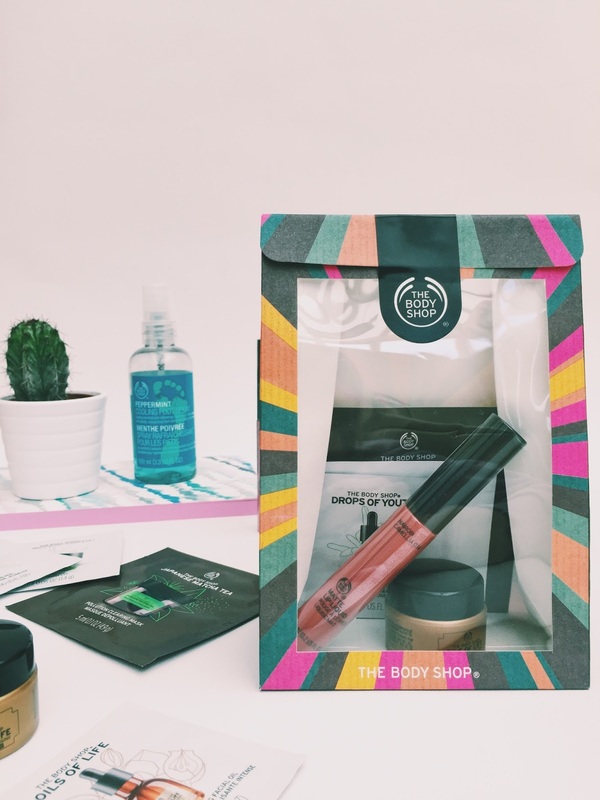 Last of all, the wonderful Body Shop topped off the evening with a little Goodie Bag for everyone. Inside the colourful little parcel was a few samples of the new products including a pot of Oils of Life sleeping cream and sachet of facial oil which I'm very excited to try because I've heard great things. A sachet of the new Japanese Matcha Tea face mask which apparently is an acquired taste but, going by what I smelt in the store, I already really love the look of this. 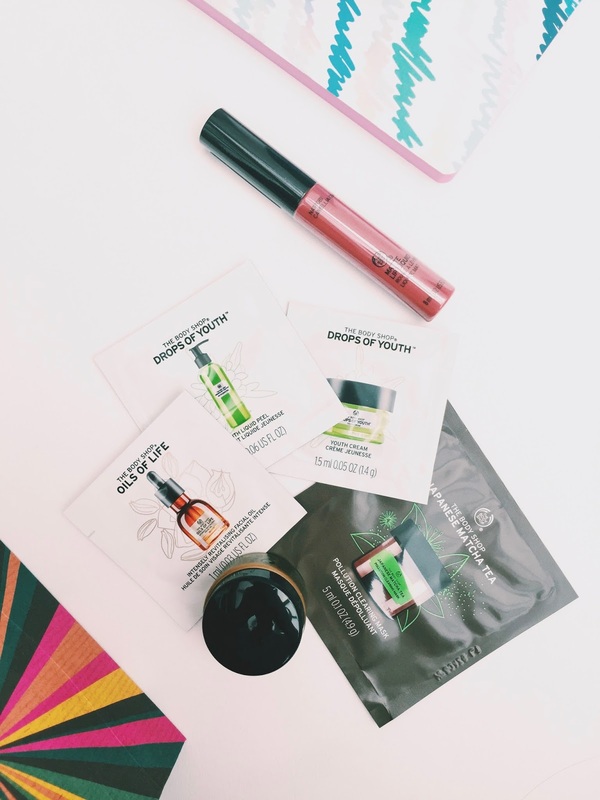 With those, there were two sachets from the Drops of Youth range which is a range that I've always spied on and wanted to try. These samples were the classic Youth Cream and the newer Liquid Peel mask which sounds totally up my street. Then, just to top it ALL off, each bag had a full size Liquid Matte Lipstick in the colour Nairobi Camellia. I am so so grateful to Gianni and The Body Shop for my invite to this event because, as a blogger who is only just settling into this kind of thing, my first two events have been nothing but welcoming and continue to make me want to learn, make friends, and be involved. I even noticed that, after going through a week or so feeling crap about my blog, being around suited people, in a lovely atmosphere, and generally in my element just lit that spark that I needed to get back at it. I honestly don't have a bad word to say about this event. I was smiling the whole time and I just feel so lucky to have been part of it. Here's to many more. I am super excited to get trying my new products! 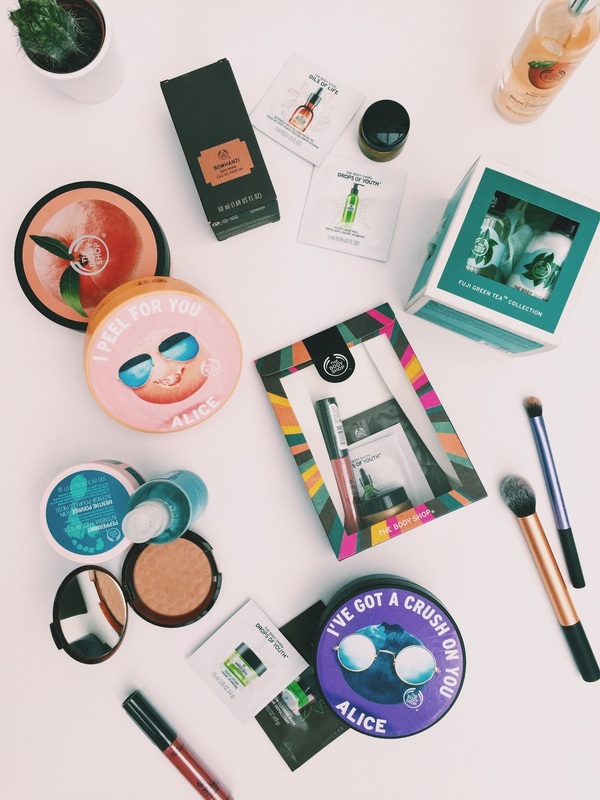 What's your favourite product from The Body Shop? expert Crash Repair. They are providing the best services in the town. I have heard a lot of positive and good rumors about them as well. I think I will visit there soon.